This graphics specialist just launched an impressive piece of silicon for the data center to defend against Intel's incursion. NVIDIA's P100 accelerator. Image source: NVIDIA. Graphics specialist NVIDIA (NASDAQ:NVDA) is known as the dominant player in the market for high-performance compute accelerators. Arguably the most powerful challenger to NVIDIA here is Intel (NASDAQ:INTC) with its line of compute accelerators branded Xeon Phi. Intel's first-generation Xeon Phi, code-named "Knights Corner," generally didn't fare all that well against NVIDIA's top product performance-wise. Intel did gain share with that product, but NVIDIA remained solidly in the lead. 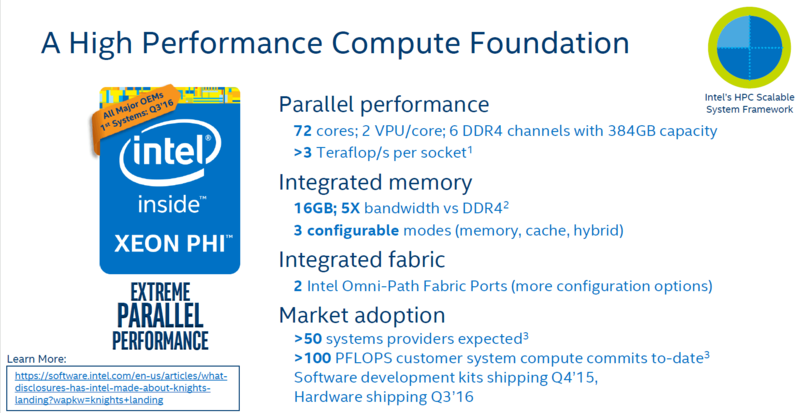 For a while now, Intel has been talking up its second-generation Xeon Phi product, code-named Knights Landing. The product is expected to deliver a significant boost in performance over the prior-generation Knights Corner, and it was viewed as a threat to NVIDIA, particularly if Intel could leverage its chip manufacturing lead to build a better/more efficient product. However, the launch timeframe for Knights Landing has gone from sometime in 2015 to early 2016 and now, per a leaked slide, first system availability is expected in the third quarter of 2016. These "slips" have allowed NVIDIA to come within a quarter or two of Intel's time-to-market with its own competitive offering based on its new "Pascal" graphics architecture. And, it would seem, NVIDIA has delivered the better product. Intel has said its Knights Landing part will offer more than 3 teraflops (trillion floating point operations per second) of compute performance in double-precision mode, and more than 6 teraflops in single-precision mode. This is impressive, but NVIDIA's just-announced Pascal-based P100 accelerator offers 5.3 teraflops of double-precision performance and 10.6 teraflops of single-precision -- handily besting (at least on paper) Intel's upcoming Knights Landing chip. In terms of performance-per-watt -- a key metric for data center customers – NVIDIA's P100 may also have a lead over Knights Landing. The P100 is rated at a 300-watt thermal design power, which is certainly high, but not out of the ordinary for very high-performance accelerators. Intel's prior-generation Knights Corner Xeon Phi accelerators, for example, were rated at anywhere from 225 watts for the lowest performer (Xeon Phi 5110P) to 300 watts for the highest performers. I wouldn't be surprised if the upcoming Knights Landing parts were rated at similar thermal design powers, particularly for the top performers. If these thermal design power ratings are representative of actual power consumption, then the NVIDIA parts should not only offer higher performance than the Intel parts, but better power efficiency, too. Intel was able to gain share with the relatively unimpressive Knights Corner parts, so I expect the chip giant to do about as well with the upcoming Knights Landing parts. I don't expect any dramatic shifts in market share, though. In order for Intel to really disrupt NVIDIA's high-performance compute efforts with its Xeon Phi family of products, it needs to make some pretty significant architectural strides. Intel simply doesn't seem to be there yet, while NVIDIA continues to make significant improvements to defend its turf. The next matchup should be between NVIDIA's Volta architecture, which is expected to come either in late 2017 or sometime in 2018, and Intel's 10-nanometer Knights Hill product. It will be interesting to see what manufacturing technology NVIDIA will use for Volta.